“Honest Abe” is a great nickname. Actually, it’s pretty lame in the realm of nicknames. It’s no Vlad the Impaler or Erik the Red, but it also implies a good nature unlike these more intense examples. 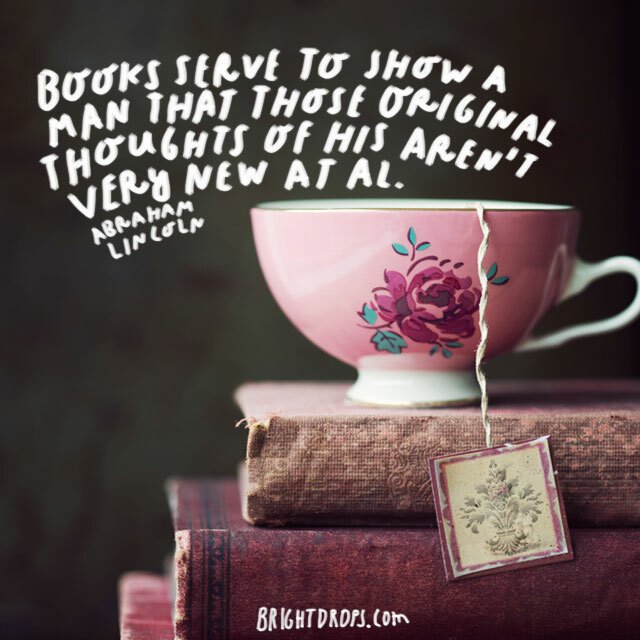 These Abraham Lincoln quotes go a bit deeper than the old “honesty” ploy and really delve into the man’s character. 1. 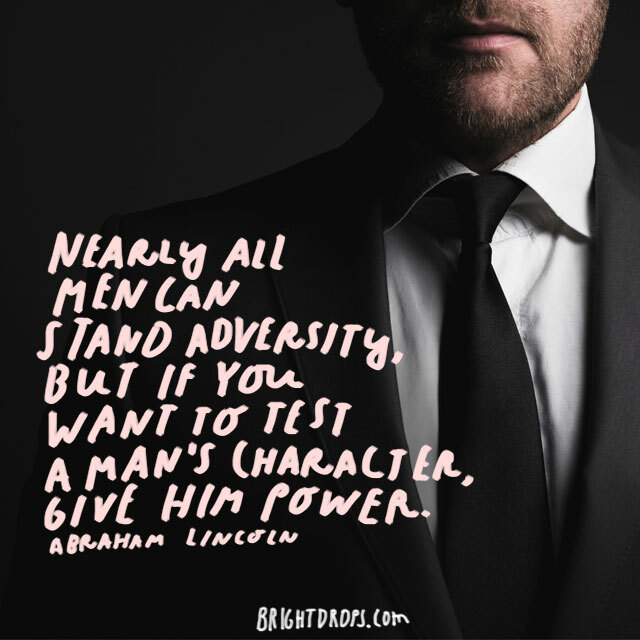 Abraham Lincoln on Adversity. The reality is that most of us will never know great power. Only a handful get to experience the power of the highest office in the world. We all face adversity. The way to truly develop character is to show it with the authority you are given, whether it’s in the work you do, the people you manage, or the family you love. 2. 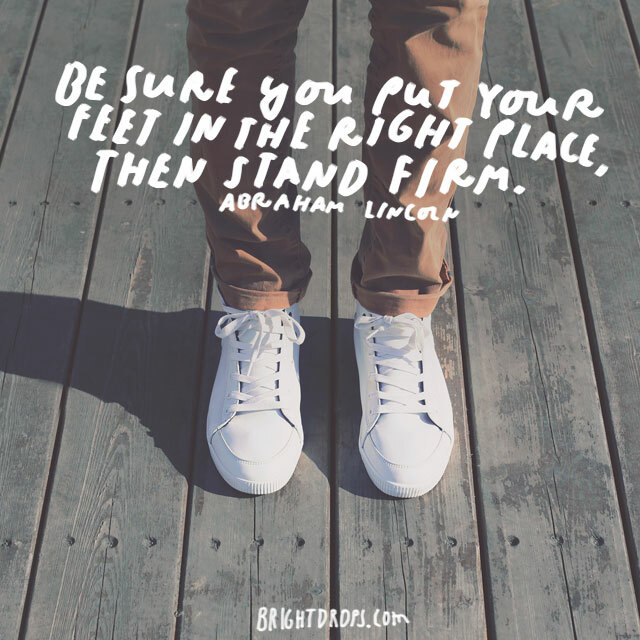 Honest Abe on Standing Firm. If you aren’t sure you are on the right side of an argument, don’t argue. When you are planted firm in a belief, you should take that stand. No one likes a petulant debater. There’s no reason to have conflict in most situations. When you stand up for something important, you had better dig in deep. 3. President Lincoln on Having a Good Memory. Mark Twain said a few years after Honest Abe said this that you should tell the truth because you won’t have to remember anything. Honest Abe earned the nickname partially because of comments like this. He was known as a very honest man and whenever asked about it, he always said things of this nature. 4. 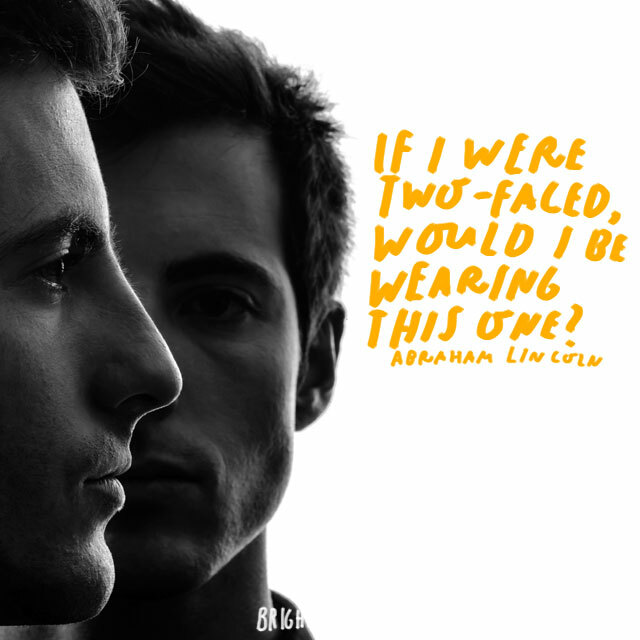 Abe Lincoln on Being Two-Faced. As far as Abraham Lincoln quotes are concerned, this one is one of the more comical. The great man let’s us know that he’s far from being a supermodel, and he’s not in denial. More importantly, he emphasizes the reality of his honest nature. He couldn’t be two-faced because it simply wasn’t even an option for him. 5. 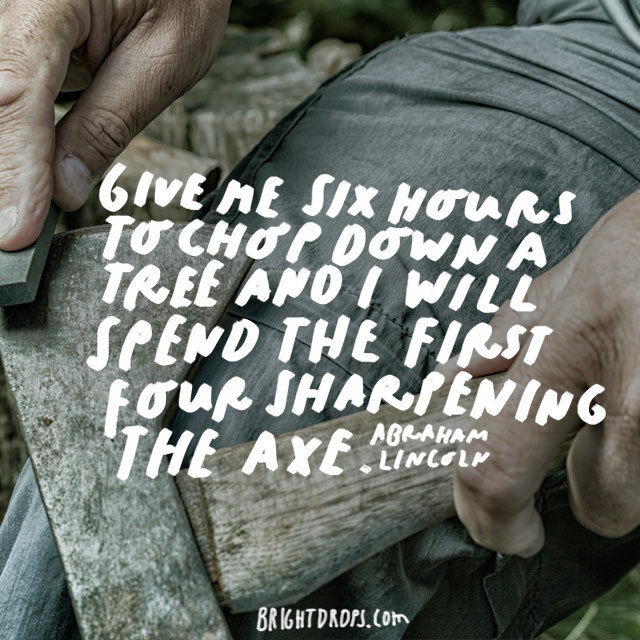 Honest Abe on Chopping Down Trees. Having a good plan and a the right tool is one of the most important elements of any job. Abe Lincoln wasn’t just talking about chopping down trees here, he was talking about his general approach to life. If you have the chance to prepare and get ready, you should take that opportunity and make the most of it. 6. 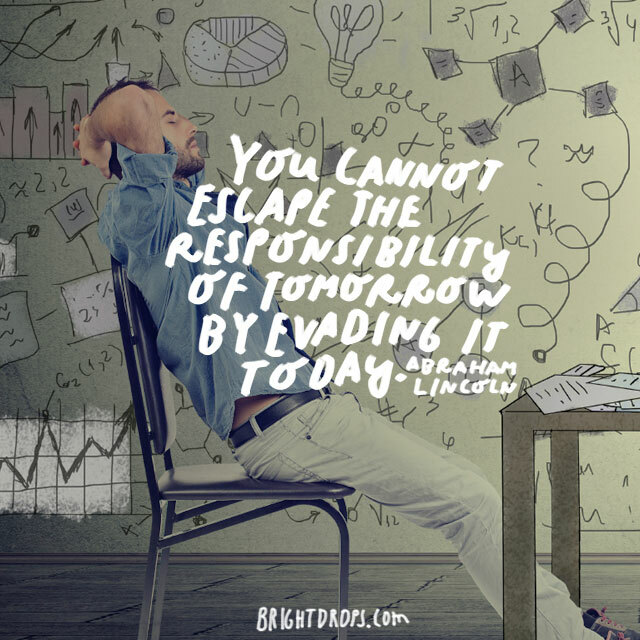 Abe Lincoln on Evading Responsibility. Many talk about getting things done today. President Lincoln was no different. If you have something on your to-do list, you may as well get it done right now. There’s no value in procrastination. Procrastination is a dishonest trait because it’s really just lying to yourself. 7. President Lincoln on Happiness. You can be as happy as you choose to be. If you want to be miserable, then you will be miserable. Abe had to lead the entire nation. Let’s not overlook the fact that it was the most difficult time in our nation’s history. He could’ve complained about being dealt a terrible hand. Instead, he realized how much control he had and used it the best he knew how. 8. 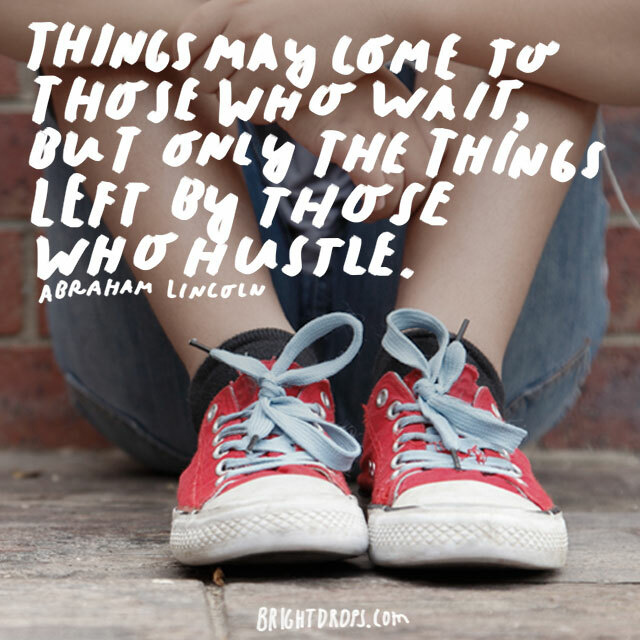 Honest Abe Was a Hustler. It’s great to sit around and wait, but you’ll only have the leftovers. Lincoln was a hustler. He ran for public office unsuccessfully more than a dozen times. That never stopped him from trying. He eventually won the ultimate office in the land because of his drive. He just wouldn’t quit. 9. 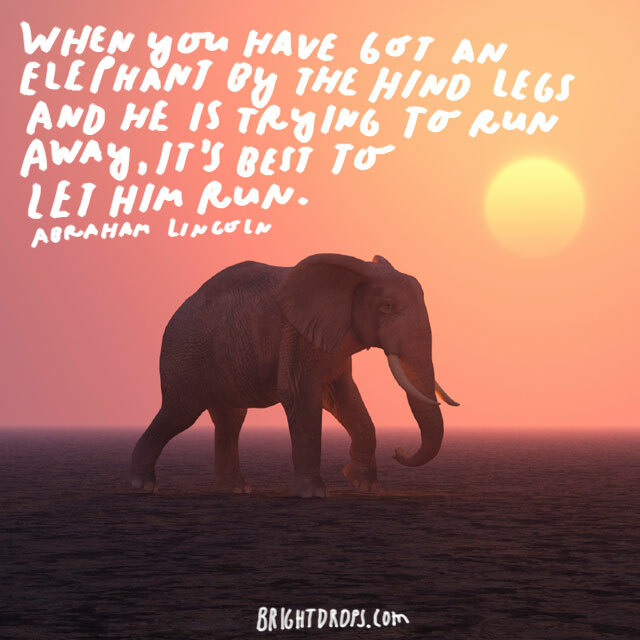 Lincoln on Releasing the Elephant. 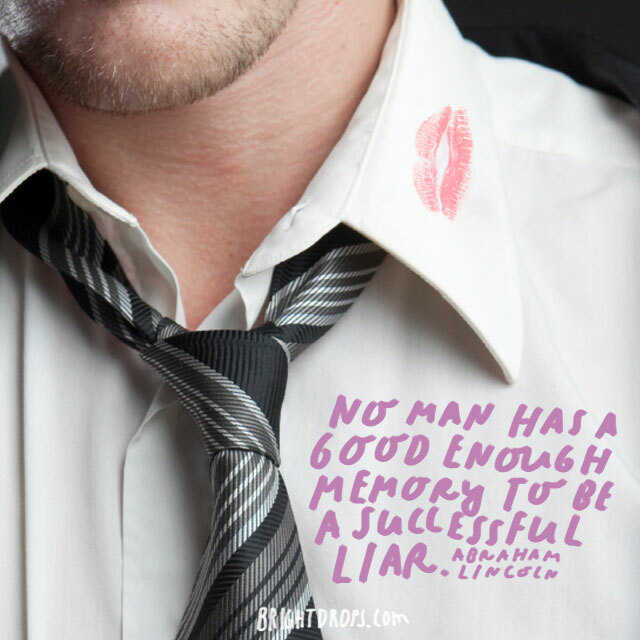 Sometimes, Abraham Lincoln quotes are about the most obvious things. The fact of the matter is, we often bite off more than we can chew. If you’re in a situation that might be a little big for you, just let go. You are not in control of the world; you can only do so much. 10. 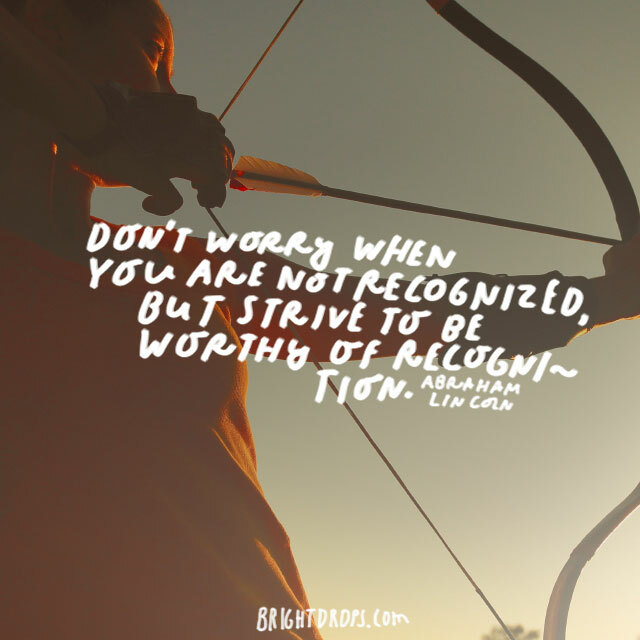 President Lincoln on Recognition. Everyone wants a little credit for their hard work. The truth is that recognition is not why you do the work in the first place. Strive to the point that you take pride in what you do, but don’t do it just for the satisfaction of being discovered. If you are looking for the approval of others, you are wasting your time. 11. 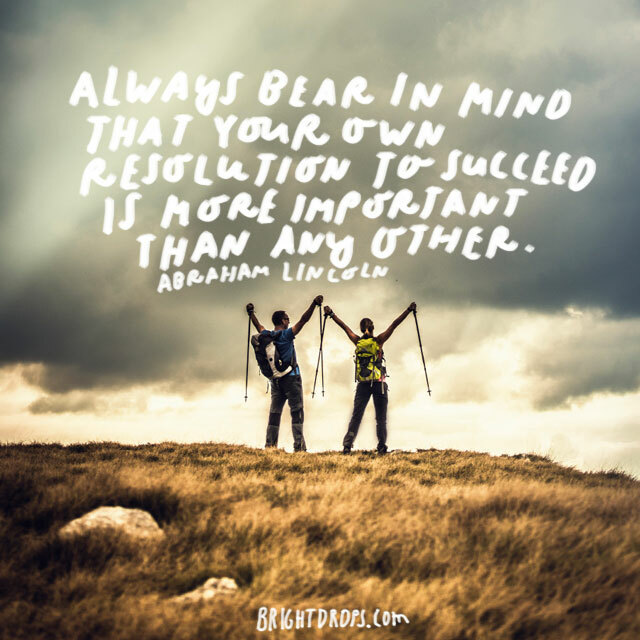 Abe on Your Own Resolution. Others’ approval is not important. What is important is your desire to succeed. If you have the drive to get where you want to be, you will get there. 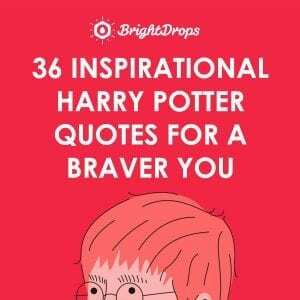 All the other qualities you have pale in comparison to your willpower. The most important factor in determining success, is your desire to have that success. 12. 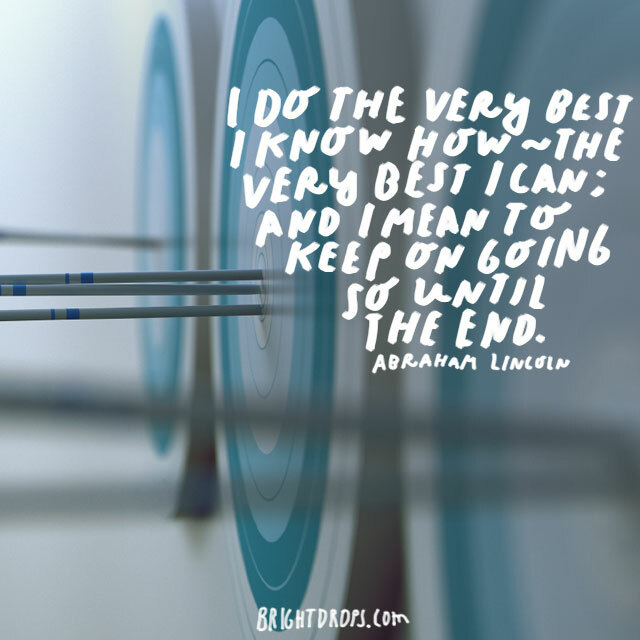 Abe Lincoln on Doing Your Best. You can have rules and guidelines for every situation you might encounter. What will really make the difference for you is having values. If you know yourself and know the desires of your heart, you will always make the right decision, regardless of the situation you find yourself in. 13. 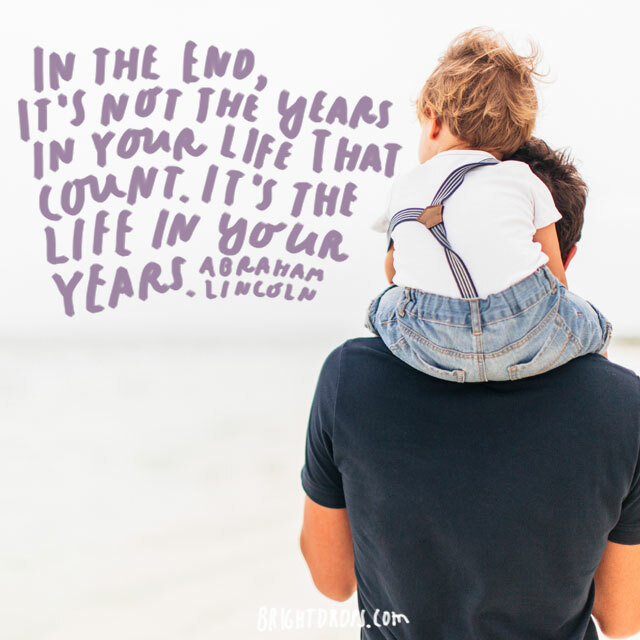 Lincoln on Living Long. Getting old is a harsh reality of living. 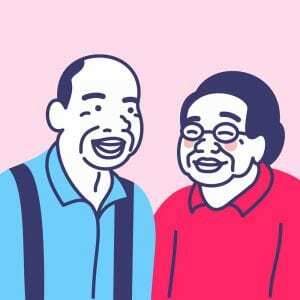 Everyone wants to set aside a nest egg and have a nice retirement, but no one ever says, “I can’t wait to be elderly.” If you want to live long, you have to understand the reality of old age. 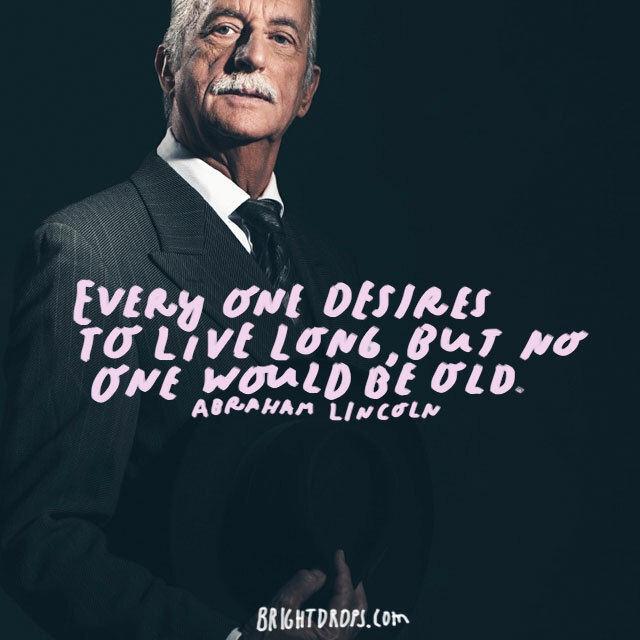 Abe understood, but he never got a chance to be old. It’s rather unfortunate. 14. 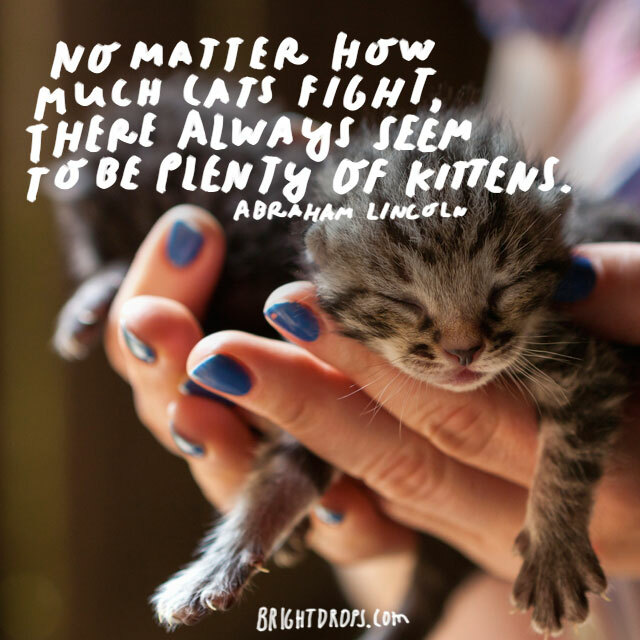 The President on the Abundance of Kittens. Cats always seem to work things out. 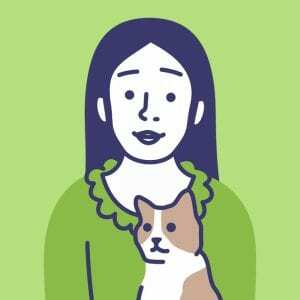 If cats can bicker with each other constantly, but still find the peace necessary to make babies, we should be able to do the same thing. What grudges are you holding onto that you should really let go. The future generations depend on burying the hatchet. 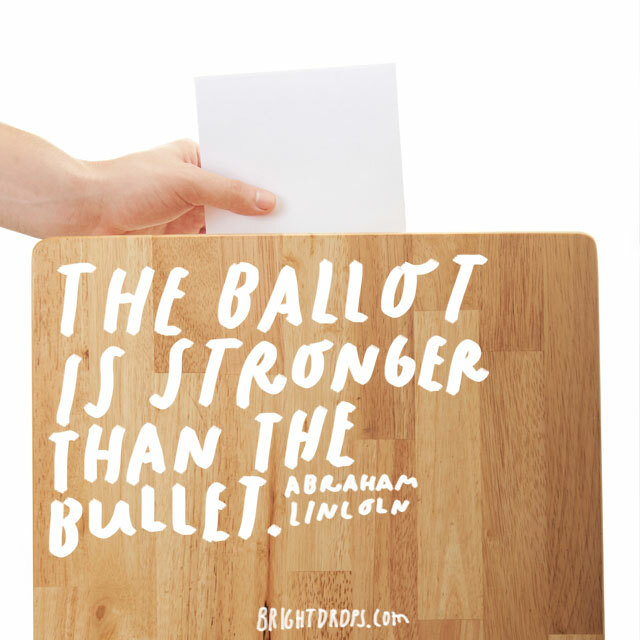 Abe believed in the power and authenticity of democracy. If he didn’t he wouldn’t have run for office as much as he did. He said this during the Civil War. He knew that the true power of the nation would be displayed in the voter’s box. 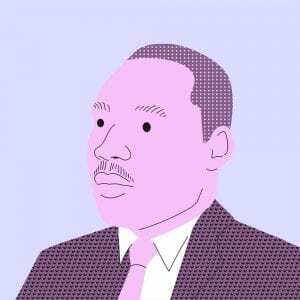 He did not fear losing his office, because he knew he stood for what was right. 16. Honest Abe on Basic Arithmetic. 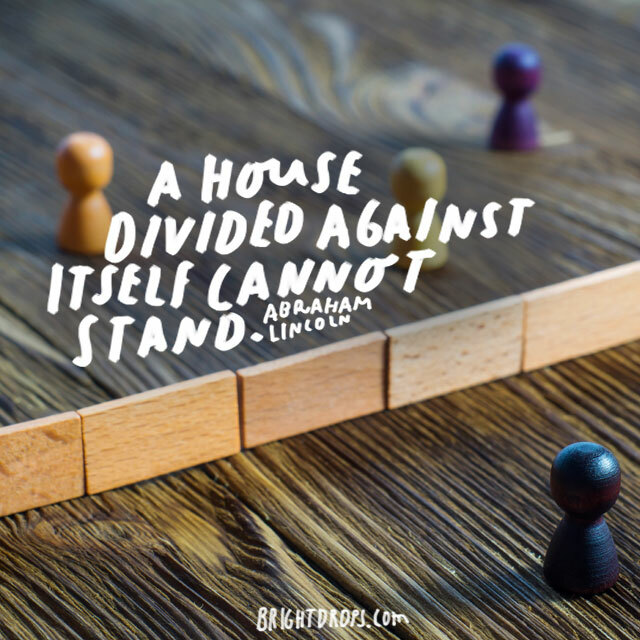 Abraham Lincoln famously said this about the nation. The Union stood strong and knew that the Confederacy would fall. The whole time, Lincoln knew this was a temporary division and was ready to accept the secessionist states back with arms wide open. We can do these same things on a smaller scale in our personal lives. 17. Abe Lincoln on Governing Men. Before the Confederates declared independence, Lincoln realized that he could not govern them anymore. Without permission to be the leader, you cannot lead. We can use this same approach to friends and family. How often do you give advice that is simply ignored? It shouldn’t stop you from helping, but don’t be shocked when they fail after not heeding your advice. 18. 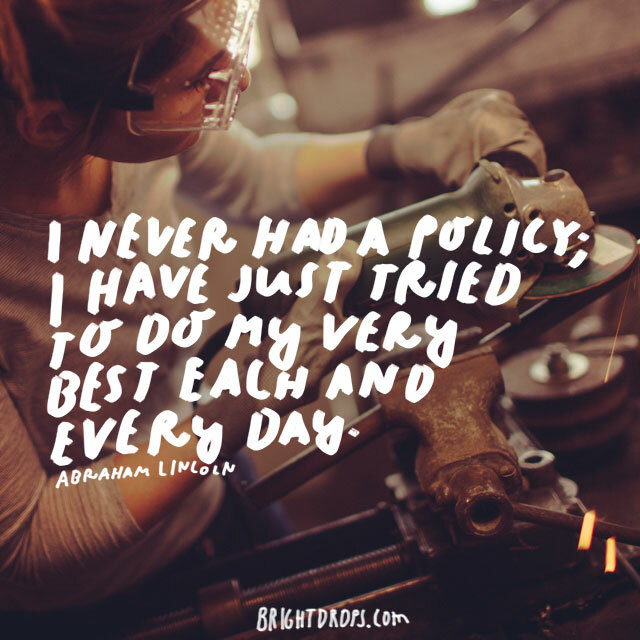 Lincoln on Doing the Very Best. All you can do is your best. Every day, Lincoln put his best foot forward in every opportunity. From a very young age, he had to be self motivated to success. He had no formal education as a child because his family needed his hands on the land and in the home. He could not settle for that; he taught himself to read and eventually earned a degree in law. Abe taught himself to read because he couldn’t attend school regularly. His entire life, he was known as a passionate reader. He was almost never without a book whether he was practicing law, reclining by the fire, or leading our nation. He was so enthralled in books that many mistook him for a bore. 20. 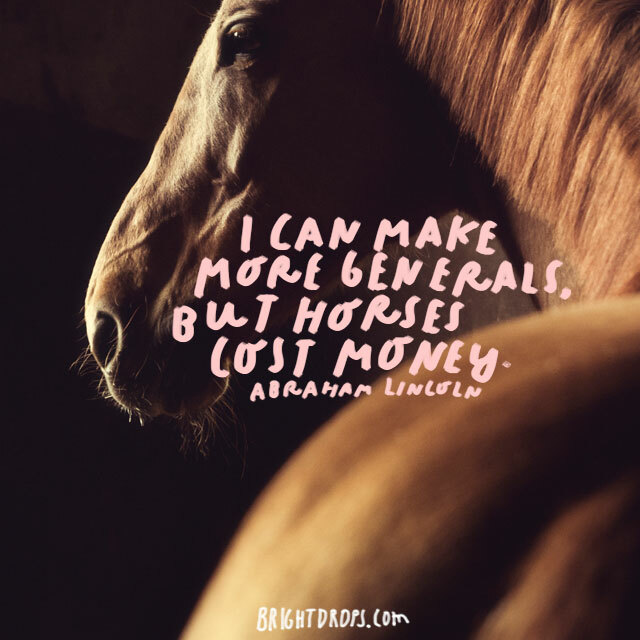 Honest Abe on the Cost of Horses. During the Civil War, troops traveled on foot. Only officers rode horses. There were some messengers and others that would frequently ride, but for the most part, you were on your own two feet. Abe could’ve promoted people to help General Grant, but the reality was that there was no point. The war was too expensive. Our military budget has changed in modern times. 21. 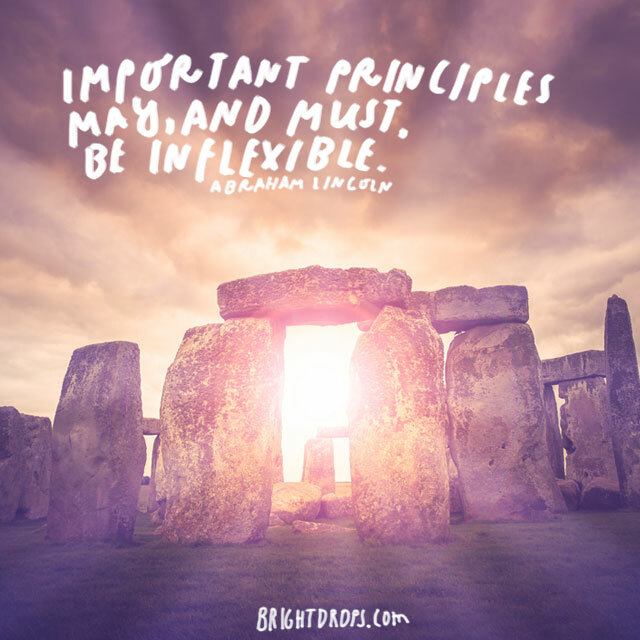 President Lincoln on Flexibility. The values you have most not be pliable. You should make a stand on things that are important to you, even if the value isn’t seen by those around you. People may question some of the stands you take, but if it is important to you, never give up. Others don’t define your views. Ever. 22. 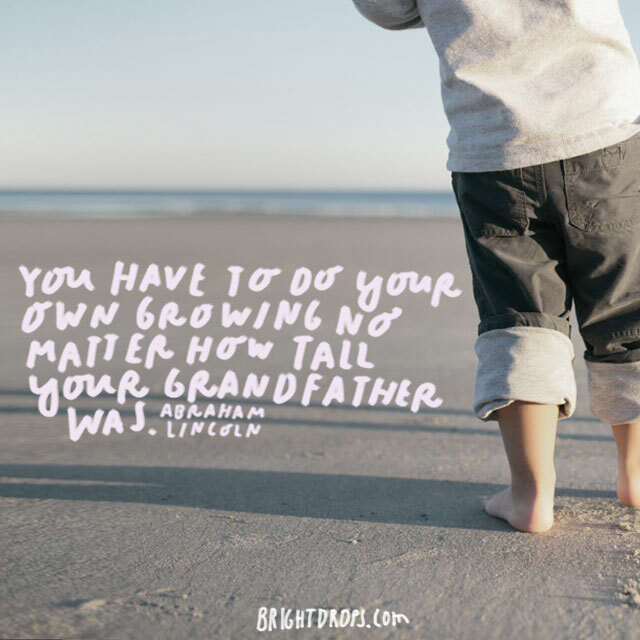 Abraham Lincoln on Height. 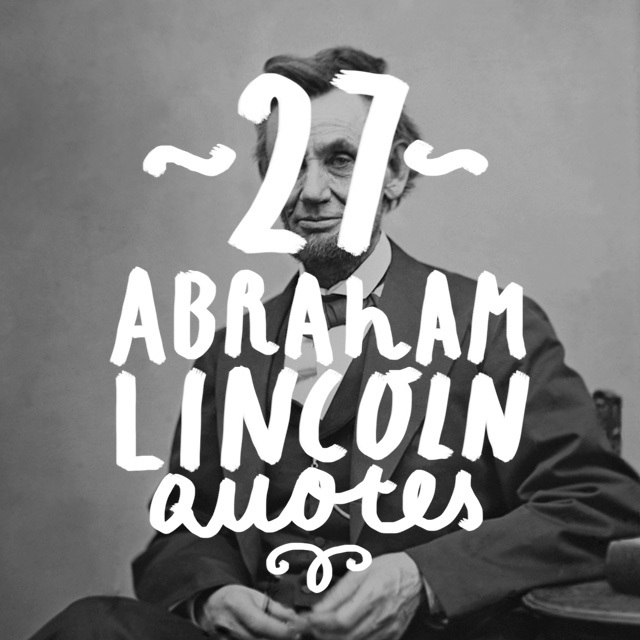 He wasn’t known for his sense of humor, but Abe got more than a few laughs. He was the tallest president to date. He was obviously not talking about height here. He meant growing in a more metaphorical sense. When you aim to do something great with your life, you have to get there by becoming the strongest you. 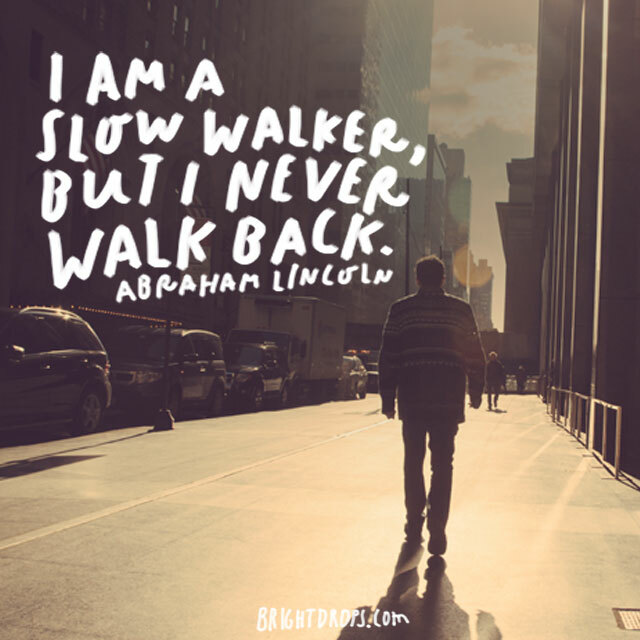 Abraham Lincoln was known for being quite stubborn. In fact, he ended up dead because he simply would yield to old beliefs that were quite dated in what was becoming the modern world. He always took his time in getting where he was going and he was never known for backing down once he expressed his opinion. 24. Honest Abe Defines Success. Anyone can achieve their own personal success. We often get misled by thinking that success is only the biggest stack of money. You don’t have to make a billion dollars to be successful. If you meet all your real goals, you are successful. 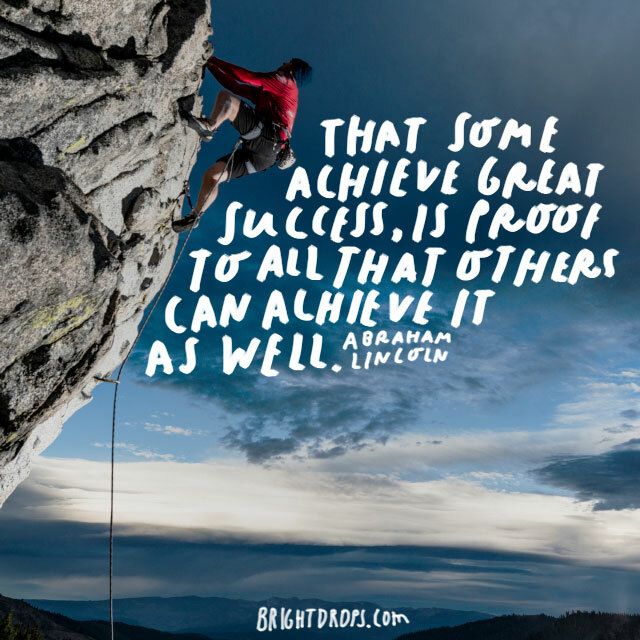 The fact that so many in the world do achieve their goals is proof that all of us can. 25. Abraham on Religious Animals. 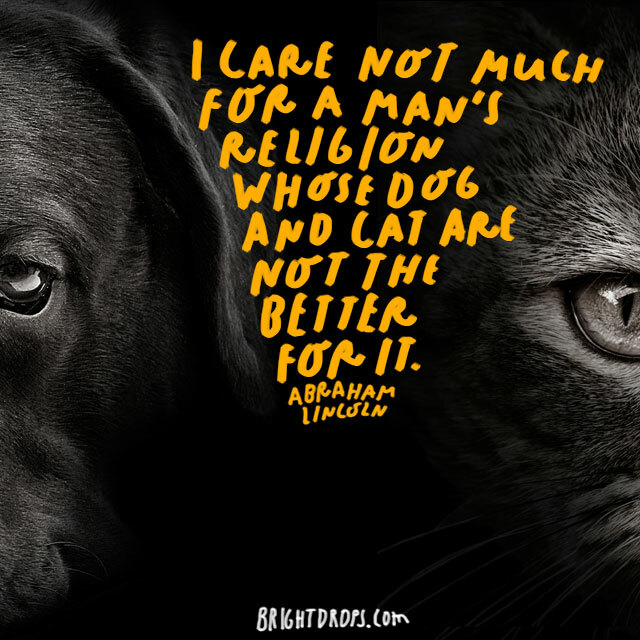 Abraham Lincoln was known for loving animals. He always kept several pets, even as a boy. The reality was that he encountered some people whom he thought were inhumane towards their animals. He could not understand having a religion that had you keep selfish ambitions higher than filling the belly of your pets. He was the first animal rights activist. 26. 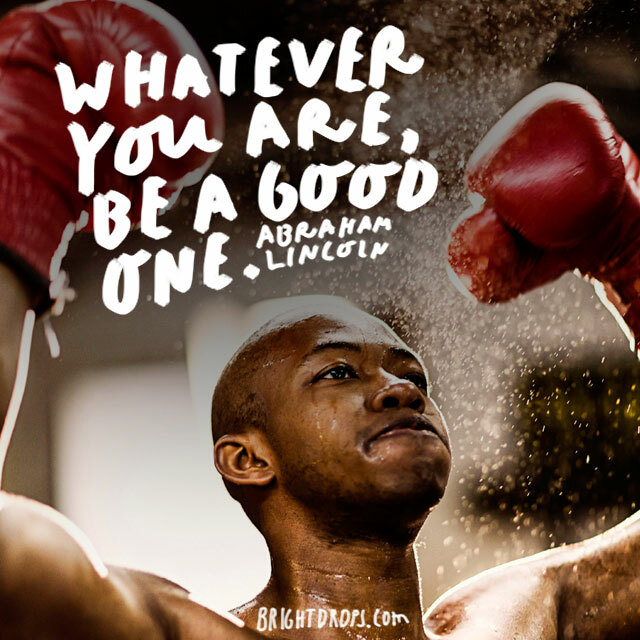 Abraham Lincoln on Being Your Best You. Abe wants you to be the best you can possibly be. Whether you want to be a statesman, a soldier, a storekeeper, or anything else in the world, be the best one. If we could all adopt that as our life philosophy, we’d be better off. Could you imagine going to a car salesman that actually wants to be good to you, not just make a commission? 27. Honest Abe on Death. If we could ask Abe now, he’d probably tell us that he has no regrets. He lived a lot more than his 56 years. In those 56 years, he made sure to do everything he ever wished. He taught himself to read, worked the land, built a house or two, earned a law degree, ran for several offices, ran the country, and even won the most important war in our nation’s history. Make sure that your years are filled with life.